We’ve all heard it, “breakfast is the most important meal of the day.” But, do restaurateurs know just how important? Business professionals often use breakfast meetings as ground zero for negotiating, meeting up with colleagues or interviews. What happens over a breakfast meeting is very important, and what is even more important is the food. Corporate employees are getting smart about mixing food and business. While the traditional meeting over lunch and dinner is always a solid move, business diners are taking full advantage of the opportunity to get up early and meet over bacon, eggs and coffee. Deemed the “power breakfast,” the movement is gaining traction throughout the restaurant industry, and many restaurateurs are taking notice by opening the doors earlier and adjusting offerings to accommodate this guest. In fact, many restaurant brands have re-branded, fast-casual version of their signature restaurant style to attract younger and more time-crunched customers while still appealing to their long-time patrons. This renewed focus on capturing the early birds creates a new revenue stream of customers that otherwise may not have been captured. So, how are restaurant brands approaching this change? Potbelly, once perceived as only a lunch and dinner brand, now offers business professionals a new breakfast section of their menu that takes the breakfast sandwich to an entirely new and mouthwatering level. 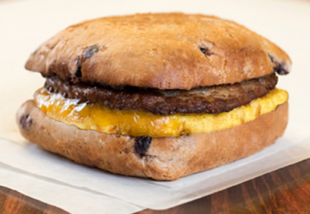 Who knew you could order a delicious egg, sausage, and melted cheddar sandwich on top of a blueberry maple square bun while negotiating a high-level client deal? Potbelly also provides corporate diners with the option to cater in breakfast for off-site meetings and events. Talk about power! Diners are also paying careful attention to what they eat for breakfast as well. The latest NRA State of the Industry study found that 7 in 10 diners would choose a restaurant where healthy food is available. Millennials are also more likely to choose a restaurant with locally-sourced, or environmentally-friendly food items. Another win in the power breakfast category is Bob Evans, where business diners can enjoy a variety of farm-fresh breakfast favorites and conduct an interview with prospective employees at the same time. No matter the occasion, business diners can enjoy breakfast meals that includes the famous Farmer’s Choice Breakfast to the famous Pot Roast Hash. Whether it’s the road warrior looking for a quick breakfast bite with colleagues or the sales professional looking to engage with their prospects over pancakes, restaurants are stepping up the breakfast game in more ways than one in order to attract the everyday business professional.